Alcoholism doesn’t discriminate by age. The problematic effects of alcohol can affect anyone of any age when the substance is abused. Problem drinking, binge drinking, and alcoholism do very. Problem drinking and binge drinking will not always lead to alcoholism. In contrast, they won’t always not lead to alcoholism. Alcoholism usually doesn’t revert back to lower levels of problematic drinking. One thing that the different kinds of alcohol abuse do have in common is their side effects. Unfortunately, when it comes to the abuse of alcohol, not one form of it is going to be less harmful than the other. Any abusive consumption of alcohol can damage the liver, the brain, the heart, and other vital organs or functions in the body. A new study highlights the lack of ageism in alcoholism by revealing that older men die more often from binge drinking than younger men do. Binge drinking is often assigned to the younger generations, with an assumption that one only becomes alcoholic once they’re older. Indeed, many new to recovery, especially at a young age, report that they thought Alcoholics Anonymous was just for old, grumpy, alcoholic men. Younger men have much more vitality and health, which might help them stave off the negative effects of binge drinking. 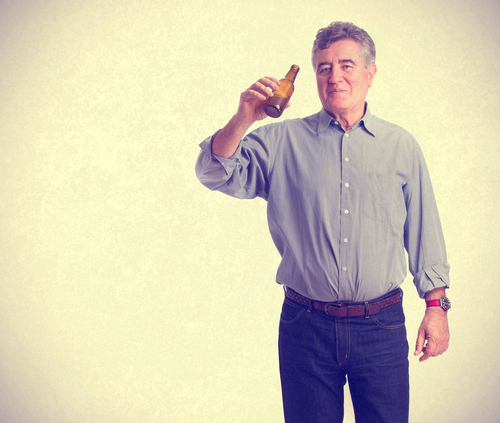 For an older man who is continuing to binge drink, even if he isn’t a fully chemically dependent alcoholic, his health might not sustain. According to the Vital Signs report from the Centers For Disease Control and Prevention, 76% of those who died from alcohol poisoning between 2010 and 2012 were men. More shocking, 82% of those men were older than 35 years old. Binge drinking is defined as any amount of alcohol consumption which can raise the BAC, blood alcohol count, to 0.08 in two hours or less. Typically, for men, that means about five drinks per sitting- the sitting being two hours. Various studies have found that even though binge drinking episodes might be sparse, they are not without causing harm. In the immediate days following a binge drinking episode, the body is weakened significantly. The immune system is down, making it ripe for contracting viruses and developing a sickness. Additionally, and most severely, the heart is also considerably damaged, causing a heightened risk for heart attack within a week after a binge drinking episode. Problems with drinking are often overlooked unless they are what would fit the image of alcoholic. Any drink that causes serious impact to physical health is a problem. Someone with a binge drinking problem does not necessarily need to get sober. They can, however, adopt a program of recovery which helps them regulate their drinking. If you or a loved one are in need of help for a drinking problem, Hired Power is here to help you with every step of the process. For more information on our recovery services, call us today at 800-910-9299.